Let’s perform a thought experiment. You were committed of a crime. How could you?! Just kidding. If found guilty, you’ll go to jail for 5 years or pay $50,000 in fines. Will you use the public defender? Or will you hire the best defense lawyer you can find? In the wrongfully accused example above, most individuals reason that the latter option (the best defense lawyer) would be the route they would pursue. When it comes to health, so many people use the parallel to the public defender option in the current healthcare system. Here’s another thought experiment (that is hopefully not your current reality). You wake up one day with low back pain. The research says that you have a 4 out of 5 chance that your acute pain (“acute” means it started 0-4 days ago) will go away on its own, whether you do anything or nothing. After ibuprofen, icing, and a few days of rest, the pain does go away. You’re in the clear. A few months later, the same pain comes back. Again, after several days, it’s gone. “How amazing is it that my body recovers from this problem so quickly?” you think to yourself. A third time, the same stubborn low back pain rears its ugly head. This time, it takes twice as long to go away. “Phew”, having dodged that painful ride for a third time. The fourth occurrence is your unlucky day. This time, the pain comes back twice as intensely. A week goes by, and it hasn’t gone away. So you spend the next 2 weeks rolling out for 20 minutes a day, leveraging various tools: lacrosse balls, foam rollers, broom sticks, and metal spoons. You find relief while mobilizing and the pain seems dissipated for a few minutes post-self-treatment, only to come roaring back 30 minutes later. Your acute pain has now become chronic. You’re in a bad place because your pain is screaming so loud you can barely think. You know you need to see someone, but based on the urgency of your situation, you haven’t had the necessary time and energy to vet out the right person to fix your problem. What are your choices to address your pain? Let’s continue the low back pain sufferer’s story through a few of the most likely options to see how this situation could play out. All of the following costs will be considered on the Visual Analog Scale (VAS) from 0 – 10. 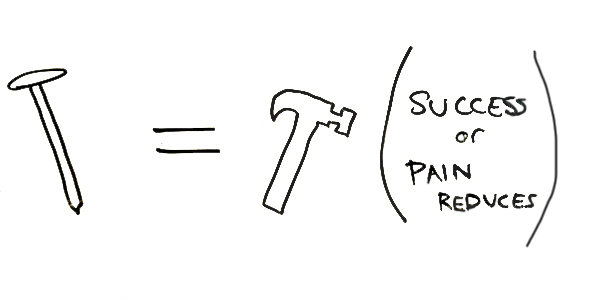 On this scale, a person rates themselves on how intense the physical pain is. For our purposes here, we will use the same scale with various costs in addition to physical pain. 0 = NO involvement, cost, or symptom. 1 – 3 = Mild involvement, cost, or symptoms. 4-7 = Moderate involvement, cost, or symptoms. 8-10 = Extreme or significant involvement, cost, or symptoms. Financial Cost: How much money you spent (dollar bills). Time Cost: How much time you spent (minutes, hours, days, weeks, months, years). Energy Cost: How much awareness and conscious energy you spent. After your efforts in addressing a problem or pain in life become observed as wasted efforts, your energy begins to diminish as your subconscious mind realizes that you cannot figure this thing out. The reality is, you only have so much bandwidth to pursue your goals and dreams. Physical Pain: How much pain you experience (subjective intensity of symptoms). You go to your MD and you’re prescribed anti-inflammatories. Subconsciously, you know this isn’t the answer. Intuitively, something had to cause your pain. You appease the doctor and take the anti-inflammatories. Perhaps your pain goes away temporarily and perhaps it doesn’t. Regardless, the problem is still there, flying under the radar, ready to rear its ugly head again without a moment’s notice. Financial Cost: 1 – one $20 co-pay. Time Cost: 1 – It takes you 2 hours of the day – assuming an hour of driving and an hour of time in the doctor’s office. Total time duration: 10 days to determine if anti-inflammatories worked. 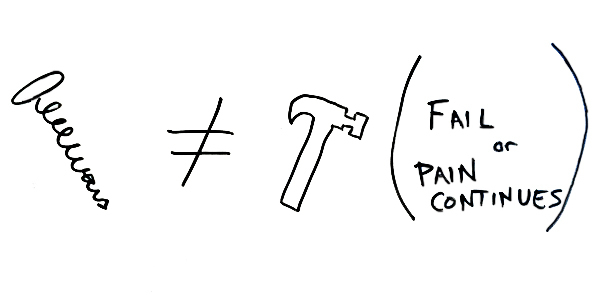 Energy Cost: 1 – There is no thinking on your part yet. You haven’t had enough pain and this is merely your first stop on the pain-train express. You expect this intervention to work for your problem. Physical Pain: 5 – The pain is significant enough for you to do something about it, but is fairly new to you. The “newness” of it indicates that it isn’t too intense, yet. You go to your orthopedic doctor, who wants to inject cortisone or another more benign substance (with PRP treatments, then inject your own blood) into the area of the complaint. Similarly to Option #1, you have a similar feeling. But this doctor is a medical doctor, right? Surely, they have all of the answers as seeing your orthopedic doctor is among the “standards of care” for pain. Maybe the treatment helps, maybe it doesn’t. Usually, orthopedic doctors are good about getting imaging on your complaint, especially when chronic. Financial Cost: 1 – $20 co-pay. Total time duration: 10 days to determine if the injection worked. Energy Cost: 3 – Seeing more providers has increased the mental cost slightly. But because you’re still in the hands of the “standard of care”, you haven’t begun to advocate for yourself in regards to what your problem needs. Physical Pain: 6 – The pain has increased a bit as you’ve continued to load (or use) your damaged body parts. Your ortho refers you to a physical therapist because it’s the “standard of care”. Your co-pay is$40 per visit. You go 3x a week for a month and 2x a week for the next month for a total of 20 visits and spend $800. Your pain is 25% better. Financial Cost: 3 – 20 visits with a $40 co-pay for $800 total. Time Cost: 4 – The full course of treatment is 20 sessions, assuming an hour of driving and an hour of time in the PT’s office, for a total of 40 hours. This is the equivalent of having a part-time job. Total time duration: 60 days to complete the course of treatment. Energy Cost: 5 – Physical therapy is still the “standard of care”, so you think this is smooth sailing. Although having to see three doctors to get here as increased the energy cost again. The third healthcare provider is starting to wear on you as the medical merry-go-ground becomes tiring. Physical Pain: 4 – The pain has gotten better by 33%, which has delivered some value to your life. With three options exhausted, you want to try a chiropractor, although you’ve already begun losing hope. The chiropractor sees you, pointing to the poor alignment of your spine. He wants to put you on a long-term plan, quoting $5,000 for a year’s worth of treatment. Maybe you try it, spending the money, only to find that again, you’re no better off than when you started. Or if the $5,000 price point is too large of an expense, you immediately write it off. Financial Cost: 7 – an annual treatment plan consisting of 42 visits that costs $5,000. Time Cost: 7 – You get treated 3x/week for one month, 2x/week for the 2nd month, 1x/week for the 3rd month, and bimonthly sessions after the initial course of treatment. Assuming an hour of driving and 15 minutes of time in the Chiropractor’s office, you spent 52.5 hours going to this doctor. Total time duration: one year to complete the course of treatment. 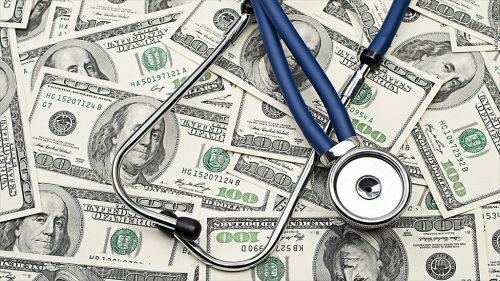 Energy Cost: 7 – The more your doctors’ efforts fail (consider that they’re your own fails by not advocating for yourself), the more your energy gets depleted. Are you seeing any patterns correlating your pain and the summed costs of ineffectively treating your pain? How is this pain, that has become chronic, affecting your life? Physical Pain: 7 – The pain is back and has only gotten worse. You’re wondering if anything was actually done to the problem area in the first place. If in any of the above situations, the intervention worked, consider yourself lucky. Financial Cost: 8 – 64 visits costing $5,880. Time Cost: 10 – if you rode the merry-go-ground through all four situations above, you’ve wasted a total of 96.5 actual hours driving to and from and spending time with these providers. Total time wasted is just under 15 months … and you’re probably still in pain. Energy Cost: 8 – Once you see how significant pain is, you realize how it literally overwhelms everything in your life. It’s like you have a cut inside of your mouth and your tongue can’t help but to constantly rub up on it. Physical Pain: 9 – Guess what? Once an acute pain becomes chronic, it tends to intensify with time. Ignorance is not answer and compensation is not a long-term strategy for resolution. clinic: a place where healthcare is delivered. excellence: the quality of being outstanding. clinical excellence: a paradigm where a health problem is presented and a gold-standard treatment is used to significantly address and impact that health problem. Clinical excellence is the concept of delivering exceptional care in the context of the scope of problems. 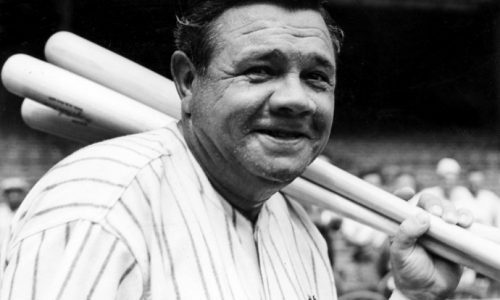 The doctor or clinic who offers clinical excellence is the Babe Ruth of their specialty, hitting home runs often and consistently. In the same way that no one expected Babe Ruth to hit singles or doubles, clinical excellence requires that expectations are communicated. 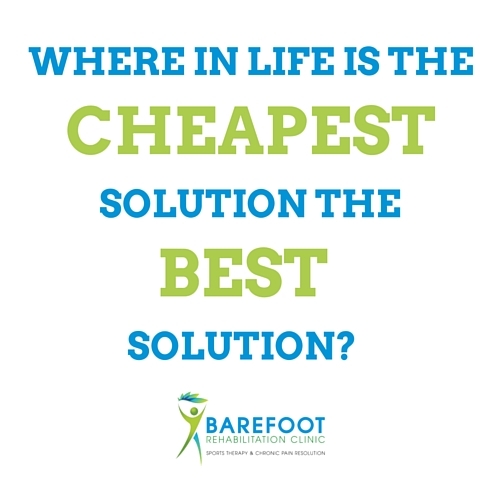 At Barefoot Rehab, we specialize in sports therapy and chronic pain resolution. We diagnose musculoskeletal conditions through the Integrative Diagnosis system and specialize in treating the primary pathology of adhesion with the gold standard treatment of manual adhesion release. Musculoskeletal: any pain caused by your muscles, ligaments, nerves, tendons, and bones. Adhesion: fascia that has ‘glued down’ your muscles, ligaments, nerves, and tendons, preventing them from stretching and being strong. Manual Adhesion Release: a manual therapy that breaks up adhesion through the hands with enormous tension. Structural dysfunction (discussed below): permanent adaptation from your bones, cartilage, or other tissue that is generally not affected through anything but surgery. An individual in pain is 30 – 60 years old (old enough to have significant adhesion, young enough to have minimal structural dysfunction). Range of motion is restricted and less than full. Motivation is based on long-term quality of life and living an enjoyable pain-free life into old age (and not necessarily to resume an athletic sport). If someone rides the medical merry-go-round, they’ve spent 64 visits for $5,880 and 15 months AND are still in pain! We significantly reduce most people’s chronic pain in 15 visits for $1195 in 2 months AND permanently affect that person’s pain (without needing more treatment). We have proof on Facebook and Google. Most importantly, we earn people’s trust by referring out quickly within 5 visits when we are striking out (which can happen in certain cases … see below). An individual has pain, but has been diagnosed with structural dysfunction: osteoarthritis, disc injuries, cartilage tears, etc. These individuals tend to be older than 70 years of age. Range of motion is full, although symptoms (i.e. pain, contraction, stretching, tension, or any other “feeling”) are present. emotional problems, fibromyalgia, or chronic fatigue syndrome. The beautiful thing about clinical excellence is that even when we strike out, patients still get enormous value by being told the truth about their conditions with a precise diagnosis and that no money, time, or energy was wasted in their brief care in our hands. Delivered value still causes patients to refer to our practice again and again. As a collective, people can see through the poor quality healthcare system. Once off the medical merry-go-round, they don’t want their friends, family and neighbors caught up in the same empty promises and wasted time/energy. And once they experience the honesty of clinical excellence, their idea of healthcare has transformed forever. They will no longer accept mediocre standards and care. So much so, that they send their loved ones to clinically excellent doctors and clinics immediately and without hesitation. they know what they’re good at (home runs). They know their magic hammer is only good for nails. they know what they’re not good at (strike outs). They know their magic hammer won’t work on screws. they have a handful of highly qualified people offering gold-standard treatment (ie. functional medicine doctors for metabolic problems, orthopedic surgeons for structural problems, psychotherapists for emotional problems, etc.) for specific dysfunctions to address any and all healthcare problems. The Clinically Excellent Doctor/Clinic does not take health insurance. Being in-network with an insurance plan means letting insurance companies dictate necessary care for a patient despite the doctor’s involvement. That’s like letting your car insurance company tell your mechanic how to fix your car. This is something that a cutting edge doctor would never do. When I was in chiropractic school myself, I was taught principles and techniques that were more than 20 years old. It was not new technology or techniques. It was not what would allow me to give patients the highest quality care available. For that reason, I’ve spent tens of thousands of dollars on my own continuing education through Integrative Diagnosis that allows me to continue to deliver the highest results for the patients I see. Whatever the specialty is that you are looking for, you should expect to not use your insurance and pay cash for quality, like any other service in life. Below is a video from Dr. William Brady of Integrative Diagnosis asking anyone who earns a wage if they would be comfortable taking a 20% pay cut, especially knowing when they’ve been a high performer. How do you find clinical excellence? It is not ok that patients don’t get the care they deserve. Clinical excellence is your ticket off of the medical merry-go-round. It guarantees success whether in the form of solutions for your issues or productive data for you to proceed. 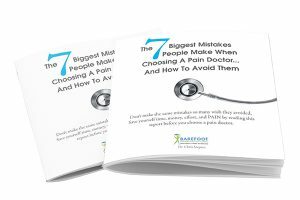 Take 10 minutes to read the 7 biggest mistakes people make when choosing a pain doctor. You’ll learn of the appropriate questions or concerns to address before choosing any doctor or therapist. Here are the details about my condition, can you help? How do the details of my case contribute to or take away from the prognosis (the likely course of resolution)? What kind of timeline can I expect to get some type of change to show I’m on the right track and to get complete resolution? What will be the financial cost of both of those timelines? Do you have testimonials? Can I see them? Do you have patients who would be willing to talk with me to ease my concerns? What have I been avoiding? How did I let this problem grow to the point it is now? What is the solution to my problem? In reflecting, asking your deepest self, without your ego’s constant yammering, the right path to your goals and dreams will have light shed on it so that you move in a direction that reduces all of the costs associated with your health, setting you up for success. If you feel entitled in any way to clinical excellence for your body because you have health insurance, I hope you have your anti-nausea pills because the ride you’re about to go on isn’t going to stop anytime soon. Tell us what your experience has been like on the medical merry-go-round? Are you still riding it or have you gotten off? If you got off, what/who helped you get off the medical merry-go-round?